It's Friday - time for "Show Us Your Life"...this week is all about your wedding party and flowers. Our wedding colors were purple - dark and lightshades. 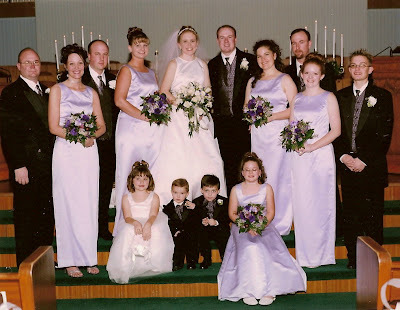 The bridesmaids wore lilac dresses and the groomsmen had a dark purple vest and necktie. Whew - FINALLY!!! What is your favorite season?...Winter, Summer...ummm, no - FOOTBALL SEASON. Only kidding, but what a wonderful time of year. The Cowboys start training camp today (as well as many other teams) which means the start of football is right around the corner. HOORAY - the excitement can hardly be contained! We love football season in our house - watching games all Sunday afternoon/evening and Monday night, playing with our Fantasy Football teams, watching all the ESPN coverage we can get, eating snacks, screaming and yelling at the tv (okay maybe that's just Riley - hee hee)...it gets even better when Fall comes and it's cold outside. Oh the simple pleasures in life! The season kicks off six weeks from Thursday- the countdown is on. There will certainly be more blog posts about football - you can count on that! Fasten your chin straps...until we meet again! 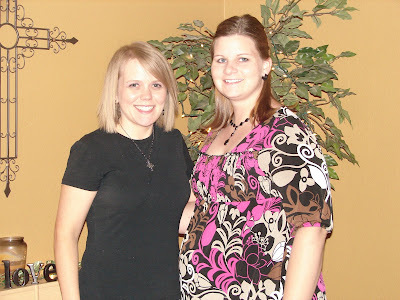 This is Carianne, my friend of 15 years this summer (we met in high school summer band 1994)! I have talked about her and you've seen pictures of her on our blog from time to time. She was in town last week from Wednesday afternoon until Saturday morning. She's expecting her first child (a baby boy - Owen) in November, so it was really neat to get to spend time with her and talk about all sorts of baby stuff, among other things as we girls tend to do - hee hee! She came to work with me on Thursday and Friday and set up a little area in my office to work on various things on her "To Do" list. We had lots of fun eating, talking, shopping, working on projects, etc. Thanks for a great visit Carianne! 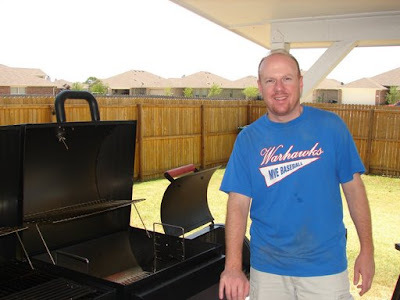 Starting Thursday, we will have John's family in town - we are really looking forward to them being here! Today is another "Show Us..." activitiy on Kelly's blog. This week - your wedding dress, so fun! 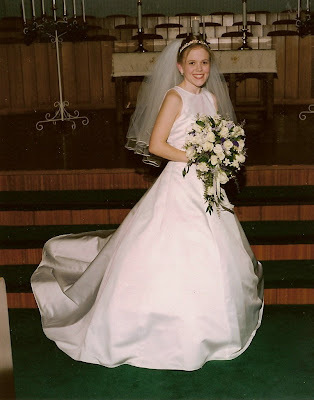 Here I am in my wedding gown on the best day of my life - February 8, 2003. John and I have been married almost 6 1/2 years and God has blessed us with such a wonderful marriage. My wedding dress was very simple, but I absolutely loved it. It was a basic design with satin bands around the waist and a tear drop opening in the back. I knew it was the dress for me the minute I tried it on. I bought my dress on a Saturday and John was working that day. After I bought it, I went and got us each a coffee from Starbucks and went by his office. When I told him "I bought a dress today", he had a big smile on his face and we were both so excited! Here are a couple of pictures of the back... Ahhhh, sweet memories! We are really looking forward to tonight and tomorrow night - it's the All-Star break in the world of major league baseball. Tonight in St. Louis, eight power hitters (four from each league) will go to bat in the Home Run Derby contest. We are pulling for the hometown boy, Albert Pujols....but Nelson Cruz (Texas Rangers) will work too! 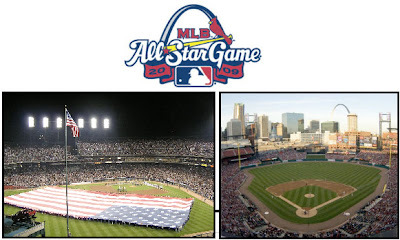 Tomorrow night it's the American League vs National League in the All-Star game. We are really looking forward to watching both of these. Tonight we are even having hot dogs and nachos like we are at the ball park - fun times! Oh how we wish we were in St. Louis, watching it there, but our living room will have to do. It's going to be an exciting second half of the season. Enjoy! 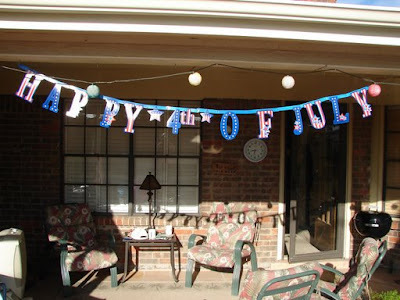 Well, it's now a week later, but we wanted to post some pictures of our 4th of July weekend. We spent the long weekend in Odessa and had a great time. There was eating (a lot! ), cooking out, hanging outside, playing games, swimming, shopping, playing golf, having tea, going to church, visiting...lots of fun indeed! We were able to see just about everyone in the family, so that was really nice (there were a couple out of town). I'm not sure how, but in all the pictures we took we managed to not get any of Kristin, Heidi or Grammy! Our apologies to you all, but no offense. I guess when pictures were being taken they weren't around, but we'll get more next time.